"Mega Drive 32" was a European-only name that I think turned up after it was announced as the Sega Genesis 32X in the US. I don't know exactly when it changed but I think it might have been quite late. There'll be clues on Sega Retro but our PDF support is bork, making it unpleasant to sift through right now. our PDF support is bork, making it unpleasant to sift through right now. Yeah, and because of this, if a new magazine is uploaded it doesn't show up in it's catagory, and if it's totally new it doesn't get a category made. Fun fact: It was July 2016 when I made a formal request for a more active technical admin to sort out this noise, as neither me nor Hivebrain have the permissions to fix things. I'm still waiting for a response. This is the earliest mention of Chaotix I could find in my collection. At this time the 32X was still called the Mega Drive 32, but was confirmed to be using the SH2 processors and everything. It's only mentioned very briefly, but it confirms that it was being planned for the 32X even at this point. Wow, I had no idea the "Chaotix" name is so old that it predates the Sonic removal! Looks like the port to 32x was under way during or not long after late April. The 32x pictured in the background looks like it has the Megadrive 32 name on the badge. 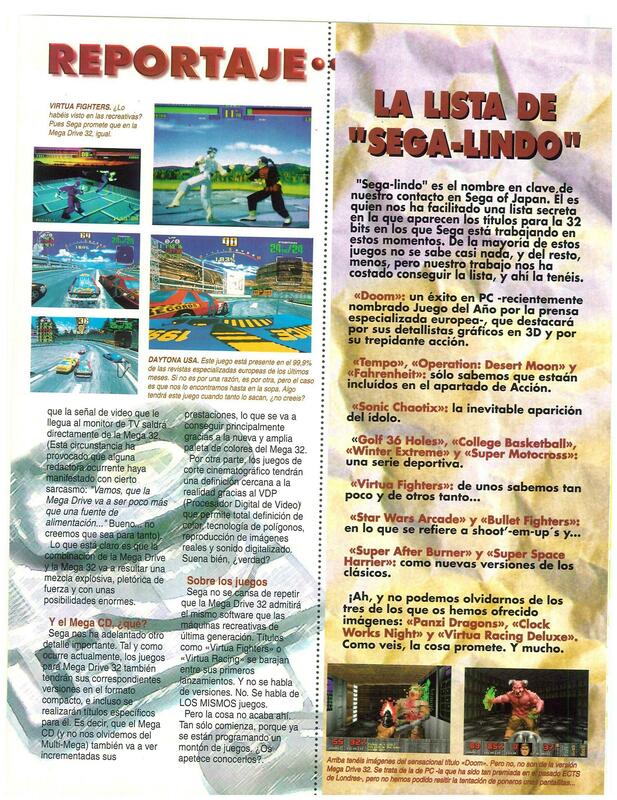 The ports of Afterburner and Space Harrier are titled "Super"
This is the earliest mention of Chaotix I could find in my collection. Oh, that one was buried in the topic of other knowledge. Those Doom screenshots are from a prototype way older than the the September builds we have! It's running fullscreen (The pictures don't show the lag) like the later protos, and the HUD looks totally different! Interesting console placement too. The text says that those are screens from the PC version. I've been wondering about Mighty's brief renaming to "Nat" that is shown in these screenshots. Given the naming scheme of the other characters, which are somewhat reflective of their personality type, the naming choice of "Nat" seems odd. At least until I discovered that "Natsu" is Japanese for "Summer" - which is something you could possibly use to describe the peaceful personality ascribed to Mighty in the Chaotix manual. Is that too far of a leap to make? If not, could it have something to do with the song title "Door Into Summer"? I'd certainly love to see some older builds some day and see a more comprehensive progression from Crackers to Chaotix. I think that's a huuuuuuuuuuge stretch but really, who knows. You're probably right. Could it be then, that when they looked back at old SegaSonic character designs and decided on Mighty to replace Sonic, that the design sheet had a preproduction name on it, and they inadvertantly used that before realising what his actual name was? The name Nat just confuses me. It doesn't convey anything about his character. It's a very odd choice. Oshima might answer on twitter if someone asks him. i.e. 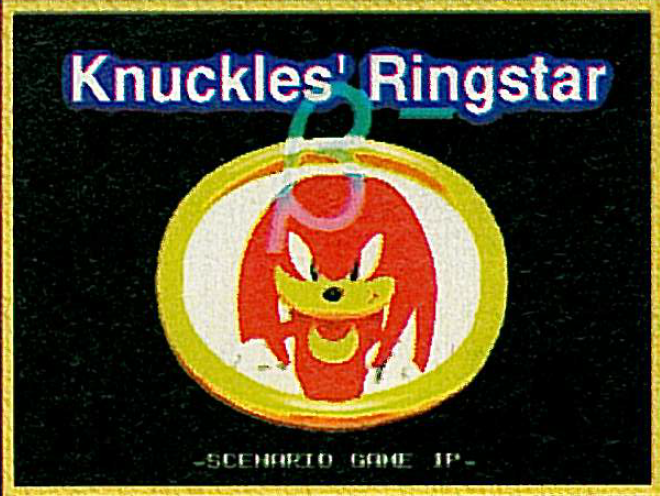 they scanned in a bit of pre-existing Knuckles art, rather than make it from scratch. 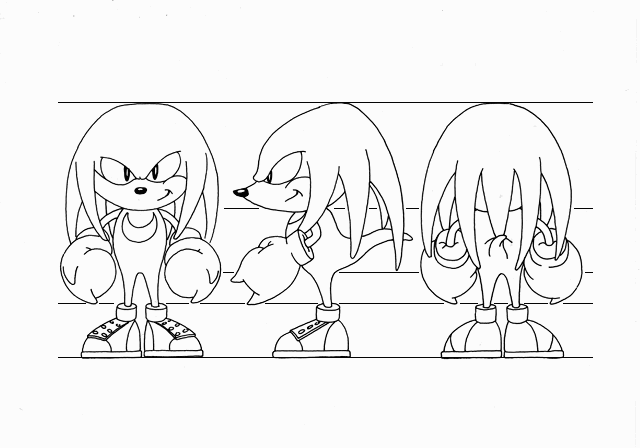 I downloaded a Sonic Jam Art Gallery archive, and lo and behold I find this picture. Essentially the same picture as the one on the title screen, though the in-game version seems to be a tad off-model. That's to be expected with a rush-job like this. Everything else seems to line up though.